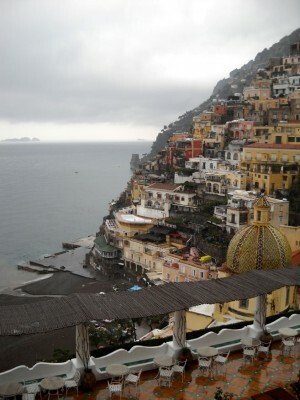 I have recently returned from Positano, Italy, where I was a lucky participant in the Sirenland Writers Conference. It was an extraordinary experience. The conference is held at Le Sirenuse, surely one of the world’s most beautiful hotels. I had a room overlooking the bay and my view was simply breathtaking. Although it’s such a luxurious hotel, I felt completely at home, everyone who worked there took care of me as if I was their closest family. The hotel is family run concern, owned by the Sersales, a house turned into a hotel, lovingly taken care of and every room individual, gorgeous artwork on the walls, a fantastic spa, swimming pool. Sirenland is held at Le Sirenuse because the manager, Antonio Sersale, loves literature, and he is the official host. But essentially the event is organised by Hannah Tinti (author of The Good Thief and the editor of One Story magazine) Dani Shapiro (author and professor of creative writing) and Dani’s husband, Michael Maren (journalist and screenwriter). There were 30 writers (participants) and many had brought family or friends. The thirty writers were divided into mixed-genre groups of three, each under the tutelage of either Dani Shapiro, Jim Shepard or Hannah Tinti (normally this would have been Peter Cameron, but he was unable to attend this year). Every morning two of us were ‘workshopped’. We had submitted 25 pages for this purpose, a few weeks prior to the event. The afternoons were free. The quality of the teaching was exceptional – I had Dani Shapiro who is quite wonderful, both as a person and as a teacher. I was impressed how she was able not only to give each of us specific help on what we had submitted, but – in the case of those who submitted portions of longer pieces – she was also able to consider the whole story. To my mind, essentially everyone came away with a way to radically increase the potential of their work – whether novel, short story or memoir. We also had a half hour one on one with Dani which was very helpful. The standard of feedback by the other participants was extremely high. 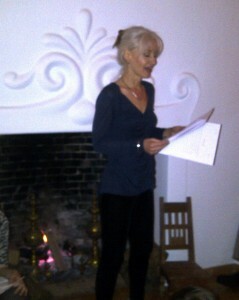 Each day there were different early evening events, readings of work by the teachers and the Sirenland Fellow, who this year was Karen Thompson Walker (who has just sold her first novel The Age of Miracles to Random House), a talk on publishing, on the writing life and so on. We had an informal talk with Jim Shepard, for example. Jim is the reason I sought out Sirenland, I am a huge fan of his writing. Although initially I was disappointed not to be in his group, it seemed to me that Dani was the perfect choice for me and what I’m writing at the moment. And Jim is very approachable, so I had some time to chat with him outside of the workshop mornings. He is a delightful man: funny, wise, irreverent, gives the best hugs. He came with his family, including his wife, the writer Karen Shepard, and each of them added something special to the week. Andrew Sean Greer gave a reading from his novel in progress, (I’ve just finished his wonderful A Story of A Marriage). Some evenings there were ’sponsored’ cocktail events, and gourmet dinners, others we had free to eat in the village. In the afternoons Judy Becker gave yoga sessions. I only did one of these on the last day, but regretted not doing more as it was such a lovely, meditative experience. A good contrast to the active socializing the rest of the time. My favourite evening we were all invited to dinner at Antonio and Carla Sersale’s home, and that’s where we had ‘open mic’ night… everyone had 2 minutes (if they wanted) to read something. I was going to read a recent story, but when I timed out 2 minutes it just didn’t have enough punch for a short read, I ended up reading a memoir piece about my first colonic which seemed to stay in people’s minds afterwards (perhaps not in a good way…). Jim’s kids gave readings.. his son, Emmett read a story of his (very impressive writing) soon be published in Subtropics; and we had a performance of a hilarious skit on Justin Bieber written (and performed) by Jake, Dani Shapiro’s son. 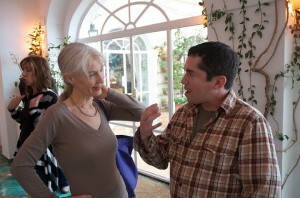 I met some wonderful people, many who I will stay in touch with, particularly to share work. And all the teachers and those involved in the publishing industry made themselves very available for ongoing connection and support. I cannot recommend this conference highly enough. Although I am not an experienced conference participant, I suspect Sirenland is quite unique in that it is kept small and focussed: you truly feel you are part of a family, a family that will not abandon you when you leave. In some ways it was similar to my recent experience of being a participant at the Galle Literary Festival in Sri Lanka, a combination of luxury and literature that I could very easily get accustomed to. This entry was posted in Conferences, Workshops and tagged Andrew Sean Greer, Dani Shapiro, Hannah Tinti, Jim Shepard, Michael Maren, Sirenland by Sandra Jensen. Bookmark the permalink.